The earthquake of June 26, 1941 was one of the strongest in the Andaman & Nicobar Islands of India. The quake generated a tsunami in the Andaman Sea and the Bay of Bengal which was particularly destructive along the east coast of India. Epicenter :12.50 North, 92.57 East. Earthquake Location: About 20.5 kms W of Flat Island, 23.6 kms WNW of Yadita (Middle Andaman Island Group), 96.7 kms NNW of Port Blair (South Andaman Islands), 617 kms SW of Yangon, Myanmar, and 834 kms NNW of Banda Aceh (Sumatra), Indonesia. Earthquake Focal Depth - Shallow. Magnitude: Originally the magnitude was estimated as Moment Magnitude, Mw 7.7M. However, based on the earthquake's long rupture, a Mw 8.1 was subsequently assigned to this event. Aftershocks: In the hours following the major earthquake, a series of powerful aftershocks struck the region. Two magnitude 6.0 events struck within 24 hours of the main shock on June 27th, 1941. The first major afteshock occurred at 07:32:47 UTC and was followed by another at 08:32:19 UTC. There were 14 earthquakes of magnitude 6.0 - up to January 1942. Felt Reports: Strong ground motions were felt throughout the Andaman and Nicobar Island groups. 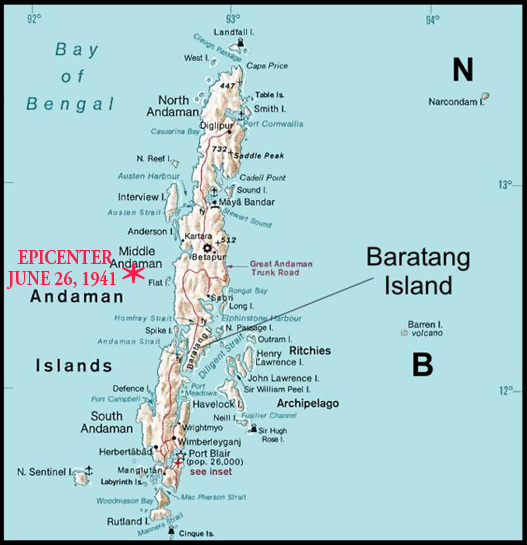 Highest intensities were experienced at Baratang Island, Shoal Bay Creek - north of Port Blair - and near Port Anson. Also, the quake was strongly felt over a large geographical region in the Bay of Bengal - particularly from the eastern coast of India (Coromandel ) to Colombo, Sri Lanka. In Madras (Chennai), two strong tremors were felt, mostly by people in tall buildings. The first of these tremors lasted 2 seconds and the second 15 seconds. Two shocks were experienced also at Vishakhapatnam within a two-minute period. The earthquake was strongly felt in Calcutta ("Kolkata"), Chandernagar and Cuttack. At Cuttack the strong motions reportedly lasted for about four minutes. In Colombo, Sri Lanka, and at Syhlet, Bangladesh, the strong ground motions were felt for a few seconds. Earthquake and Tsunami Damage and Death Toll: No detailed records are available from the Andaman and Nicobar islands - which were under Japanese occupation at that time. However, the death toll on the islands is estimated at over 3,000 and there is no specific record on the death toll and damage caused by the tsunami. Extensive eartquake damage occurred primarily on the Middle and South Andaman Islands. Most of the masonry structures in and around Port Blair were badly affected. The earthquake destroyed Cellular Jail - a three-story building - and all buildings on Ross Island, the administrative center of the British government. Although there is little and confusing information, it is believed that the 1941 tsunami impacted the east coasts of India and Sri Lanka. It is estimated that about 5,000 people on the east coast of India were killed. Although there had been no storms in the region during this period, the local newspapers incorrectly attributed the deaths and damage to a storm surge. The possible effects of the tsunami on Thailand, Bangladesh or Myanmar are not known. The distribution of aftershocks indicates that the total length of the rupture was about 800 km. The Andaman Sea is a highly folded and spreading geosynclinal basin, about 650 km wide from east to west and about 1200 km long from north to south. Its total area is estimated to be 600,000 to 800,000 km2. The Andamans and the Nicobars are a group of 349 islands - summits of a submarine mountain range situated on the western side of the basin, formed by tectonic interactions. The present configuration resulted about 26 million years ago. The islands are the boundary separating the Andaman Sea basin from the Indian Ocean. The Andaman group has a total of 325 islands, while the Nicobar group has 24 islands. Only 38 of these islands are inhabited. Tectonic Setting and Seismotectonic History of the Andaman Sea Basin. Tectonic Setting - The Andaman Sea Basin, is a seismically active region at the southeastern end of the Alpine-Himalayan belt,. For millions of years the India tectonic plate has moved in a north/northeast direction, colliding with the Eurasian tectonic plate. The Indian plate's eastern boundary, along the Andaman and Nicobar islands and Northern Sumatra, is a diffuse zone of seismicity and deformation, characterized by extensive faulting and numerous large shallow and intermediate earthquakes. The Burma microplate encompasses the northwest portion of the island of Sumatra, as well as the Andaman and Nicobar Islands. Further to the east of the Andaman and Nicobar islands, a divergent boundary separates the Burma plate from the Sunda plate. Seismotectonic History - The seimotectonic history of the region is extensively covered in the scientific literature (Sinvhal et al.1978, Verma et al. 1978). More recent research documents the following regional tectonic evolution. 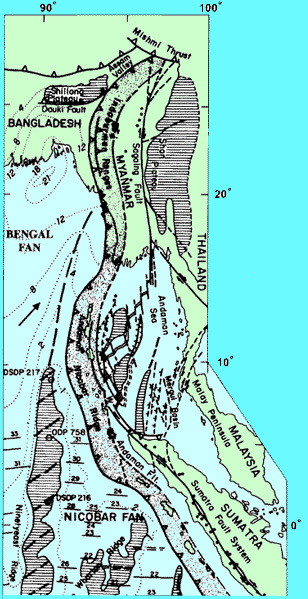 Accoesingly, an extensional feature developed along a leaky transform segment of the megashear zone - the Andaman fault - between the Indo-Australian domain and the Sunda-Indochina block (Uyeda and Kanamori, 1979; Taylor and Karner, 1983). This old shear zone acted as a western strike slip guide for the extrusion of the Indochina block about 50-20 My (Tapponnier et al., 1986) - and in response to the indentation of the Indian tectonic plate into Eurasian block. Collision of Indochina with the Sunda and Australian blocks stopped this crustal extrusion process. Subsequently, the Andaman fault system - recently prolonged through the Sumatra zone (the Sumatra fault) - reactivated due to the lateral escape of the Sumatra forearc sliver plate and as a result of the oblique convergence and subduction with the Indo-Australian plate. 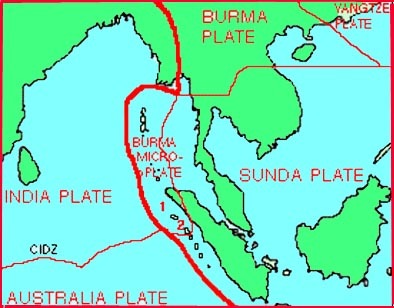 The Indian plate's oblique subduction beneath the Burmese Microplate has created the Andaman segment of the great Sunda Trench. 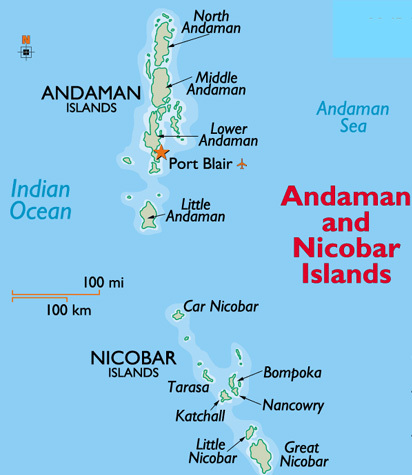 The Andaman and Nicobar Islands are located within the tectonic sliver near the boundary of the Indian plate and the Burmese Microplate. Similarly the oblique subduction has created the north-south trending West Andaman fault - another strike-slip fault system in the Andaman Sea to the east of the island chain. The Volcanic Arc - The subduction process has also formed a volcanic arc. There are two known volcanoes along this arc. The one in the North is known as the Barren Island Volcano - considered active as it has erupted within recent times. The other is known as the Narcondum volcano and is considered dormant. Seismicity of the Region - Shallow and occasional intermediate-depth earthquakes delineate the subducted slab under the Andaman-Nicobar islands joining the seismicity trend of the Indo-Burman ranges. The active seismicity of the Andaman Sea Basin, has caused many minor and intermediate earthquakes, a few major events ,and only one known earthquake with magnitude greater than 8. According to the literature (Bapat 1982) from 1900 to 1980, a total of 348 earthquakes were recorded in the area bounded by 7.0 N to 22.0 N and 88.0 E to 100 E.
Seismicity of the region The map shows all historically recorded earthquakes in the Andaman & Nicobar Islands. Earthquakes having magnitudes greater than 4.0 since 1973 are also shown. The earthquake of June 26, 1941 generated a tsunami in the Andaman Sea and the Bay of Bengal which impacted India's east coast and Sri Lanka. The possible effects of the tsunami on Thailand, Bangladesh or Myanmar are not known. It is estimated that about 5,000 people on the east coast of India were killed. Local newspapers incorrectly reported that the deaths and damage were caused by a storm surge. Meteorological records do not support the occurrence of a storm system on the Coromandel Coast during that period (Murty, 1984). There is not much information other than some newspaper accounts which indicate that the height of the tsunami may have been about 0.75 to 1.25 meters. At the time no tidal gauge was in operation. Mathematical estimates indicate that the height of the tsunami could have been about 1.0 meter. During an eighty year period, from 1900 to 1980, a total of 348 earthquakes were recorded in the area bounded by 7.0 N to 22.0 N and 88.0 E to 100 E. These earthquakes ranged in magnitude from 3.3 to 8.5 (Bapat, 1982), but only five of these had magnitudes equal to or greater than 7.1 and generated tsunamis (Murty and Bapat, 1999). For the shorter period from 1916 to 1975, only three of the earthquakes had magnitudes greater than 7.2 and generated significant tsunamis. (Verma et al., 1978). There are a few more cases of earthquakes of magnitude less than 8.0 which have given rise to some smaller tsunamis. Bapat, et al (1983) have reported a few more earthquakes on the coast of Myanmar. The historical record indicates that in April 1762, an earthquake along the Araken Coast off Myanmar generated the earliest known tsunami in the Bay of Bengal. On October 1847, an earthquake near the Great Nicobar Island generated another tsunami, but no details are available. On 31 December 1881 a magnitude 7.9 earthquake near Car Nicobar, generated yet another tsunami in the Bay of Bengal. Its height recorded at Chennai was one meter. Two other earthquakes with magnitudes of 7.25 to 7.3 (which occurred on 17 May 1955, and 23 August 1936) probably did not generate significant tsunamis for the following reason. Tsunamis usually are associated with dip-slip type earthquakes rather than with strike-slip type earthquakes. According tto Pickering (1981) earthquakes in the Andaman region are associated mainly with strike-slip type of faulting. It is believed that these events probably occur along the north-south trending West Andaman fault. Up to the 26 December 2004, the earthquake of 26 June 1941 had been the strongest ever recorded in the Andaman and Nicobar Islands, in generating a destructive tsunami. The 1941 event was the last great earthquake in the Andaman and Nicobar Islands. The 1881 Nicobar Islands earthquake (M7.9) was the only other event of comparable magnitude. Based on these statistical and historical information, it can be concluded that most of the earthquakes in the Andaman Sea Basin - even those with magnitudes greater than 7.1 - do not usually generate significant tsunamis. As already discussed, the possible reason for the low number of tsunamis is that most of the earthquakes in the Andaman Basin are mainly associated with strike-slip type of faulting that involves lateral crustal movements. The exception was the 26 December 2004 earthquake, which, not only ruptured the Great Sunda Arc along the northern Sumatra region but also ruptured the same segment in the Andaman Sea as that in 1941. A possible explanation for the extreme tsunami generated in the Andaman segment in December 2004 is that this event had a different mechanism which involved both thrust and bookshelf faulting within the compacted sediments of the Andaman Sea segment of the Great Sunda Arc and large ocean floor dispacements over a long rupture (Pararas-Carayannis, 2005). It can be reasonably concluded that large earthquakes along the northern end of the Great Sunda subduction boundary in the Andaman Sea do not occur frequently. However, events with magnitudes greater than 7.1 - when they occur - have the potential of generating local destructive tsunamis. Finally, earthquakes with magnitude 8.0 or greater (such at the 1941 and 2004 events) - associated with "dip-slip" types of vertical crustal displacements along thrust faults - have the potential of generating very destructive tsunamis in the entire Bay of Bengal Region the Andaman Sea and the Indian Ocean. Bapat, A. (1882). "Tsunamis and earthquakes in the Bay of Bengal", Tsunami Newsletter, International Tsunami Information Center, Honolulu, Volume XV, No. 3, 36-37. Dasgupta, S., Pande, P., Ganguly, D., Iqbal, Z, Sanyal, K, Venkatraman, N.V., Dasgupta, S., Sural, B., Harendranath, L., Mazumdar, K., Sanyal, S., Roy, K., Das, L.K., Misra, P.S., Gupta, H., "Seismotectonic Atlas of India and its Environs", Geological Survey of India, 2000. Pacheco, Javier F., and Sykes, Lynn R., "Seismic moment catalog of large shallow earthquakes, 1900 to 1989", Bulletin of the Seismological Society of America, v. 82, no. 3, p. 1306 - 1349, 1992. Sinvhal, H., Khattri, K.N., Rai, K. and V.K. Gaur. (1978), "Neotectonics and time-space seismicity of the Andaman Nicobar region", Bulletin of the Seismological Society of America, Volume 68, No. 2, 399-409. Srivastava V. K. and Ranjana Ghosh, Report of the Dept. of Applied Geophysics, Indian School of Mines. Tandon, A.N., and Srivastava, H.N., "Earthquake occurrence in India: Earthquake Engineering", Sarita Prakashan, Jai Krishna Vol., 1-48, Meerut, 1974. Tapponnier, P., Peltzkr, G. and R. Armijo, 1986, "On the mechanism of collison between India and Asia". In: COWARD, M.P. & RIES, A.C. (eds) Collision Tectonics. Geological Society, London, Special Publications, 19, 115-157. Verma, R.K., Mukhopadhyay, M. and N.C. Bhuin. (1978), "Seismicity, gravity and tectonics in the Andaman Sea", in "Geodynamics of the Western Pacific", Proceedings of the International Conference on Geodynamics of the Western Pacific - Indonesian Region, March 1978, Tokyo, Advances 'in Earth and Planetary Science 6, Supplement Issue of Journal of Physics of the Earth, edited by S. Uyeda, R.W. Murphy and K. Kobayashi, Center for Academic Publications, Japan Scientific Societies Press, Tokyo, 233-248. Pararas-Carayannis, G., 1992. "The Earthquake and Tsunami of 2 September 1992 in Nicaragua"
Pararas-Carayannis, G. 2001. "The Great Tsunami of August 26, 1883 from the Explosion of the Krakatau Volcano ("Krakatoa") in Indonesia"
Pararas-Carayannis, G., 2003. "Near and far-field effects of tsunamis generated by the paroxysmal eruptions, explosions, caldera collapses and massive slope failures of the Krakatau volcano in Indonesia on August 26-27, 1883". Presentation for the International Seminar/Workshop on Tsunami "In Memoriam 120 Years of Krakatau Eruption _ Tsunami And Lesson Learned From Large Tsunami", August 26th _ 29th 2003, Jakarta and Anyer, Indonesia; Journal of Tsunami Hazards, Volume 21, Number 4. 2003. Pararas-Carayannis, G., 2005. "The Great Earthquake and Tsunami of 26 December 2004 in Southeast Asia and the Indian Ocean"
Pararas-Carayannis, G., 2005. "The Great Earthquake and Tsunami of 1833 off the coast of Central Sumatra in Indonesia"
Pararas-Carayannis, G., 2005. "The Great Earthquake and Tsunami of 28 March 2005 in Sumatra, Indonesia"
Pararas-Carayannis, G. 2007, "The Earthquakes and Tsunami of September 12, 2007 in Indonesia"